This article provides in-depth fundamental analysis of MRF Ltd, the market leader in the Indian tyre industry having one of the most recognized brands in the industry. 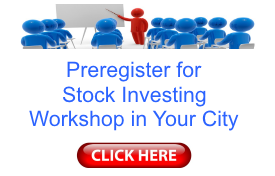 I have learnt a lot from your articles and analysis that you share with investors through your website. 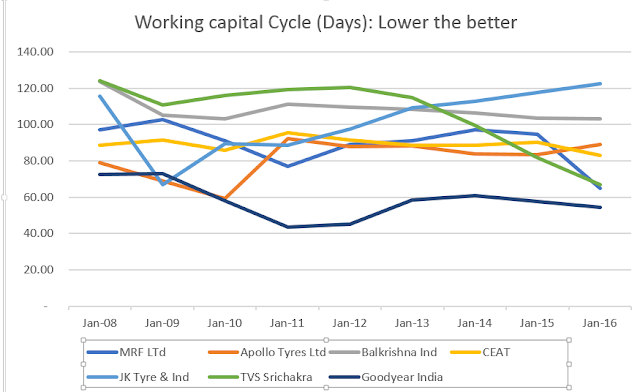 I have tried to do a bit of analysis on MRF Ltd vs rest of tyre manufacturers in India. It would be great if you could spare some time to analyse it further and share your inputs. For analysis, I have used your recommended steps and the model and tried to do some justice with it. In parallel worked on association with sports (cricket, boxing and car racing & rallies) and built a strong brand over years. Won JD Power Award 12 times in 16 years => brand with Quality + Recognition. Current Products/ Businesses: Tyres, Sports (bats, kit), Funskool (toys), Paints & Coats, and Pre-treads. MRF has increased its sales at a healthy rate of 21% p.a. It has been able to grow its operating profit margin (OPM) from 6% to 21% and Net profit margin (NPM) from 2% to 11% over last 10 years. The company has been consistently paying taxes over years. It is expected that the company should at least create a wealth of INR 1 in market capitalization for its shareholders for every INR 1 of earnings retained by it. Higher the value created, the better. MRF has been consistently growing cash flows from operations (CFO) and used it to for capital expenditures (CFI), dividend to shareholders and repayment of Debt (CFF). Higher the CFO, the better! CFO is consistently greater than PAT and signifies that cash collections aren’t getting stuck in working capital. 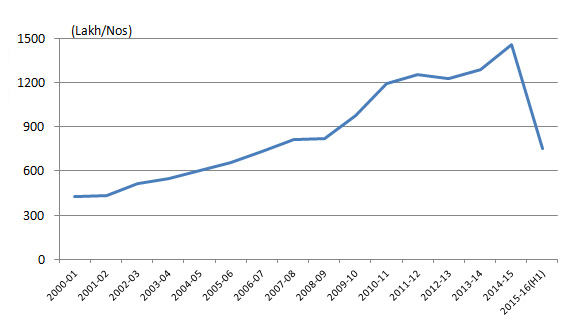 FCF/CFO = 22% => 22% of the cash flow from operations is available to shareholders in last 10 years. Higher the ratio, better it is. 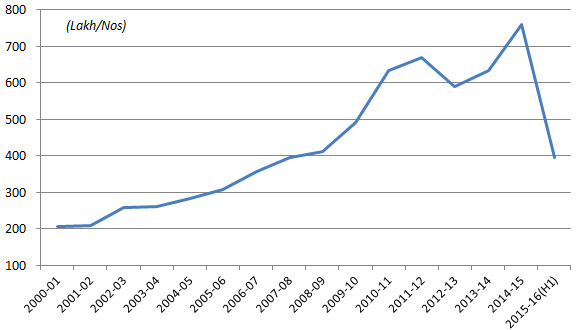 SG to capex =Sales Growth over last 10 years/proportion of CFO used as Capital Expenditure. Higher the Ratio, better it is. During comparison among companies, the higher SG to Capex ratio identifies companies which show higher sales growth while having low capital expenditure requirements. SSGR higher than the sales growth rate is desirable. 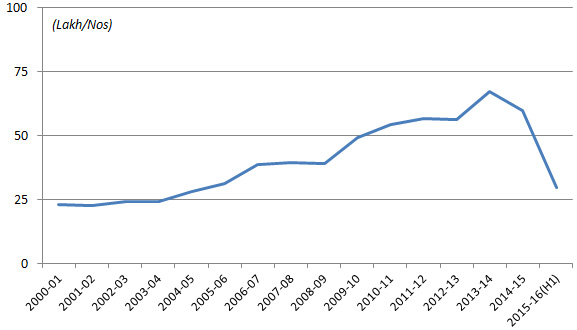 Represents the debt-free self-sustainable growth rate potential of a company. It has been observed that companies growing at a higher rate than SSGR are using more resources than their inherent operations can produce and therefore, witness increasing debt levels. Similarly, the companies that are growing at a rate less than or equal to SSGR are able to sustain their growth rates without raising debt/see declining debt levels. For MRF Sales Growth (21%) ~ SSGR (22%). Higher the ratio, better it is =PBT/average of Net Fixed Assets at the start and the end of the financial year. This is to highlight that if a company is not able to earn at least 10% or Bank FD rate from its fixed assets, then it should ideally sell all its assets and put the amount in a bank fixed deposit and earn a higher return without taking the pains of running a business. Higher the ROE, the better. However, always be cautious with the companies with high ROE and high Debt/Equity. In such companies, high leverage is the reason for high ROE, which is not sustainable. If a company isn’t able to earn at least 7% post tax from its equity or shareholders’ funds, then it should ideally put its entire equity in a bank fixed deposit and earn a higher return without taking the pains of running a business. For MRF, ROE is 41% for Mar’16 and has been above 20% for last 8 yrs. Higher the ROCE, the better = EBIT/average of total assets at the start and the end of the financial year. For MRF, ROCE is 33% for Mar’16 and has been above 15% for last 8 yrs. Represents the incremental returns/profits generated by the earnings retained by the company over any consecutive three year’s period. Represents the efficiency of utilization of incremental money being deployed by the company management in its operations. 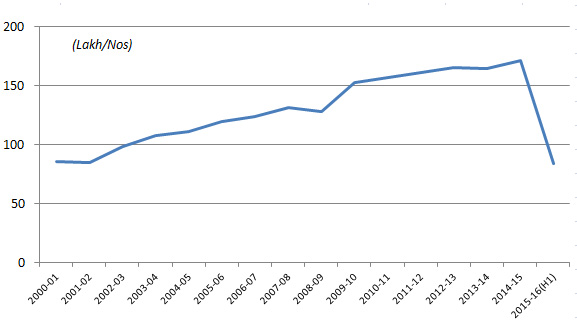 Ideally, incremental ROE 3 years rolling should be stable or improve. For MRF, this has been fluctuating in alternate periods. 09, 11, 13 and 2016 have been better than 10, 12, 14 period respectively. MRF’s promoters hold only 27.53% vs BI (58.3%) and TVS (45.36%). Preferred zone > 50%. When we compare these 3 companies on PBT/ Avg NFA, NFAT turnover, Inventory turnover and receivable days, TVS is the most efficient in using its fixed assets with MRF as a close second. However, BI’s receivable days of 65 is almost double of MRF and TVS and NFAT T.O is just 1/4th of the two. PEG for MRF (0.31) and TVS (0.36) are both in desirable range and shows that there’s healthy growth which is cheaply available in the market. 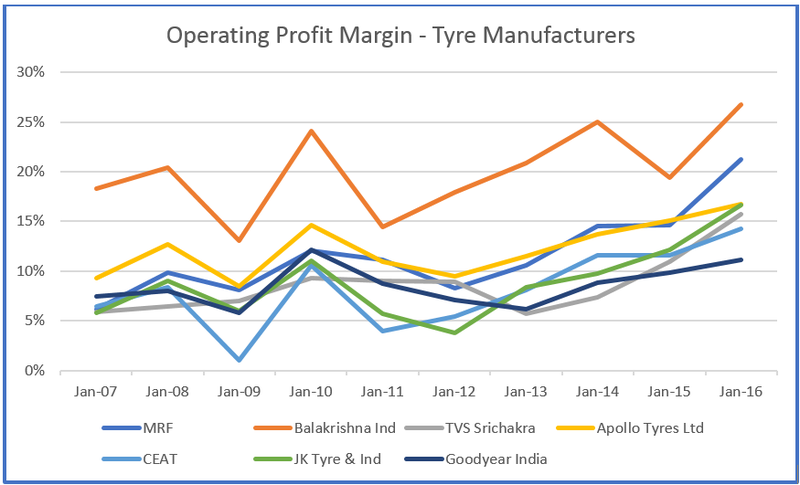 After doing the business analysis and valuation analysis and when compared with the competition, we figure out that MRF has been the fastest growing tyre manufacturer in India and reasonably priced, a company which has improving profitability margins and decreasing working capital cycle. Rahul Mammen (Whole time director and overseeing Finance, Automation and Process upgradation) with 15 years of work-ex in MRF is paid 58.9L p.a. (0.02% of PAT) is very reasonable. Remuneration to Promoters, Directors and Key Managerial Personnel is quite high for BI (10.7%) and TVS (9.2%) as compared to industry avg (6%) and MRF’s 2.8% (Overall Ceiling as per the Company Act 2013 is 11%). The %change however for all the 3 have been in line or less than the % growth in profit over the previous year. Successful execution of increase in production capacity especially by greenfield/brownfield plants is a good indicator of competent management. It is very good if the capacity addition has been done without facing any delays. MRF has been consistently paying a dividend from its free cash flows and has grown the dividend payout at 20% CAGR => sign of a good management. Preferred companies with Promoter shareholding > 50%, which ensures that management control is with themselves. In MRF promoter shareholding is low at 27.53% => a red flag!! After analyzing the management of MRF, we can notice that it has a competent management, which cares about shareholder’s interests and believes in company’s future. MRF seems to have put in place a succession plan, which would enable the next generation to take over the company. However, a 27.53% promoter holding is a concern. The increased capacity built up by the various industry players will see heated competition with severe price discounting being the norm and it is critical to protecting your Company’s turf in the commercial tyres and the two-wheeler segments which will be under severe pressure. The long pending issue of inverted tax is yet to be resolved despite the numerous representations made to the Government. The natural rubber import is required to maintain competitiveness in the International market as the gap between natural rubber production and consumption is quite substantial and hence duty concessions should be extended for import of natural rubber and other raw materials. A permanent solution to this has been sought, as it will be very important for the Indian tyre Industry in the long run, though in the current commodity scenario, due to the lower prices of raw materials like rubber and crude oil, this may not have been of immediate critical concern. 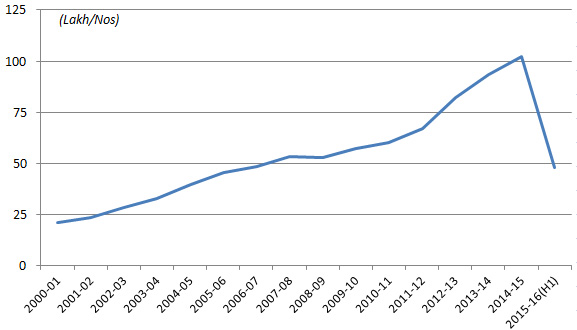 Tyre imports into India, mainly in Truck and Bus Radial (TBR) tyres have grown by over 250% during the last 2 years. China’s share in the TBR imports is about 90%. This sharp rise in the Imports, if continued, will lead to underutilization of TBR and also Truck and Bus Bias (TBB) capacities. THREAT: Import of two-wheeler tyres is a growing threat and continues to grow YoY. Moreover, foreign players have started creating capacities in India which will be a new threat in the coming financial year. New domestic players are also entering the two-wheeler segment which will make the market even more competitive. Raw material prices are expected to increase compared to last year on the back of increased demand although prices hinge on China’s economic growth and exchange rate. COMPETITION: Keeping in mind the highly competitive nature of the industry, there is a continuous struggle by all the players to improve their respective market shares. Cheaper imports from China and South-East Asian countries during the year further added to the competitive pressures faced by the industry, while the threat of foreign players setting up dedicated capacities in India to compete with the domestic players looms large. Imports of Second hand/Retreaded tyres (major categories) is restricted under EXIM Policy and can be done with an import license. Tyres imports under Regional Trade Agreements (Asia Pacific Trade Agreement, Indo-Sri Lanka, SAFTA, India-Singapore, ASEAN, India-Malaysia etc.) allowed at preferential rates of import duty. All tyre industry related raw materials can be imported freely (under OGL). Natural Rubber (NR) principal raw material of Tyre Industry, is in the ‘Negative List` (i.e. not eligible for any concession in Custom duty) under various Trade Agreements, i.e. India-ASEAN Free Trade Agreement, India-Sri Lanka Free Trade Agreement, South Asian Free Trade Agreement (SAFTA), India-Malaysia Comprehensive Economic Cooperation Agreement (CECA), India-Singapore Comprehensive Economic Cooperation Agreement and India-South Korea Comprehensive Economic Partnership Agreement (CEPA). Tyre industry in India is very competitive with about 40 players and more international players setting up capacities here. With imports from China growing to the tune of 250% in last couple of years the situation for domestic players worsens and pressure on profitability margin increases. With Rubber and Crude as the key raw material for the industry, duty concessions on rubber imports and crude price movements remain key concerns and variable impacting the profitability for the manufacturers. 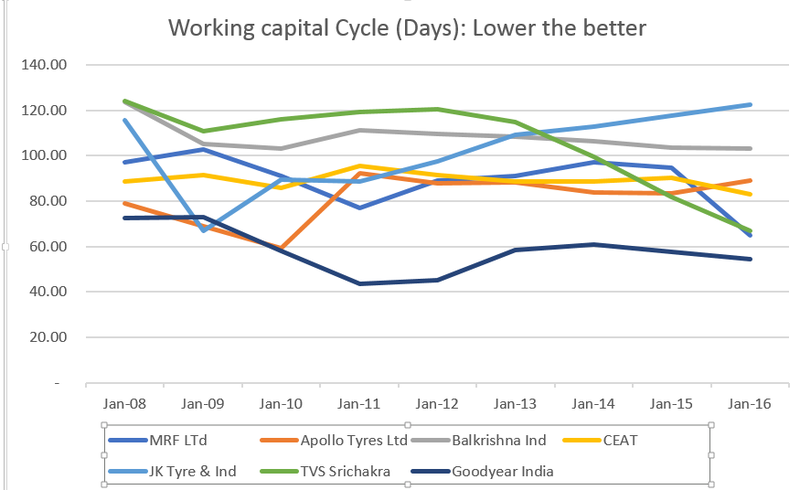 Also, tyre industry depends largely on the domestic as well global economic situation (Passenger, LCV, CV, Agri etc.) as can be seen from the above charts…across industry there was a drop of 40-50% production due to global uncertainty and drop in demand. We appreciate the hard work you have put to prepare this report on MRF Ltd. 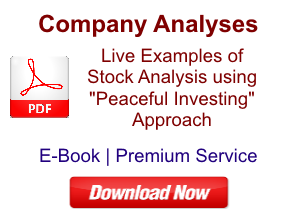 The report is useful for any investor who wishes to analyse MRF Ltd. I thank you on behalf of all the readers of www.drvijaymalik.com for the time & effort put by you. We notice that while analysing MRF Ltd, you have used standalone financials of the company. 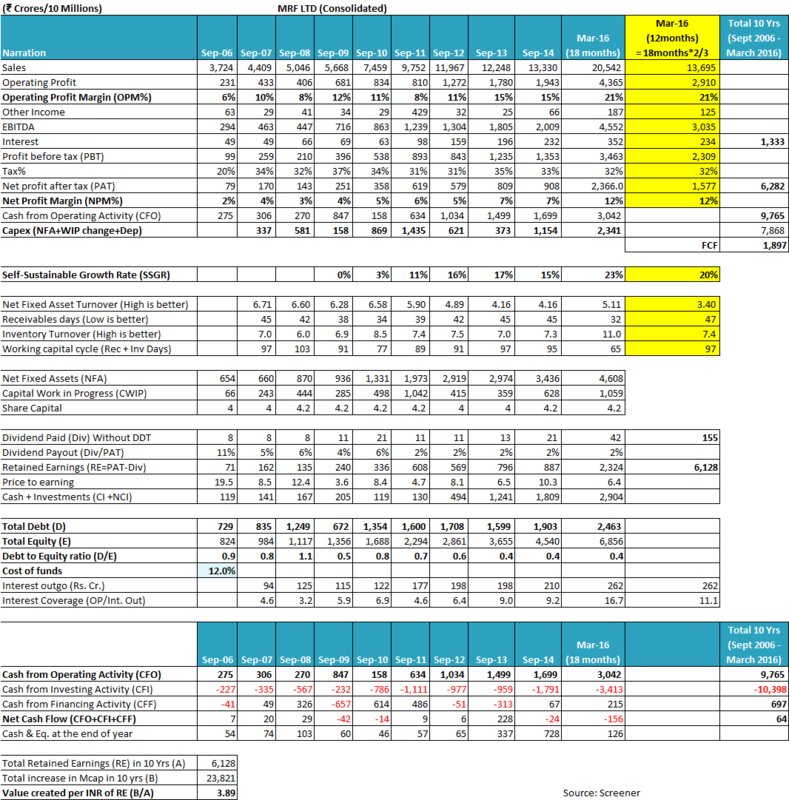 We prefer to analyse consolidated financials while doing an analysis of the company. This is because consolidated financials represent the position of the complete business operations of any company irrespective of it having multiple subsidiaries, joint ventures, lines of business etc. The consolidated financials represent the whole pie whose stake every single share held by the investor represents. Therefore, while providing our inputs, we have analysed the consolidated financials of MRF Ltd. 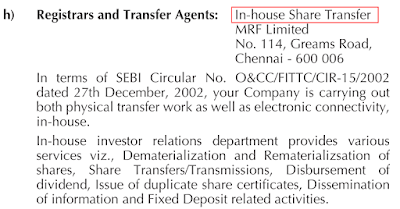 While analysing the annual report for FY2016 (18 months: Oct 2014 – March 2016), page 112, an investor would notice that in the case of MRF Ltd, the share of the business in the standalone entity (MRF Ltd) is very large in overall operations. MRF Ltd (standalone) has 99% of total group assets and contributes to 98.08% of total group profits. Therefore, even while analysing the standalone financials an investor might not be way off the mark while understanding the group position. However, it is always advised that investors give more importance to consolidated financials over standalone financials during the assessment of any company. Even in the case of MRF Ltd, at March 31, 2016, the standalone entity has a total debt of ₹2,065 cr. whereas at the consolidated level the group has a total debt of ₹2,463 cr. Therefore, while analysing only the standalone financials, an investor may miss out on about ₹400 cr. debt, which is taken by the subsidiaries of MRF Ltd. Missing out on such critical information would impair the parameters like debt to equity, interest coverage etc. and may present potential negative surprises for the investor in future. Investors need to focus on another key aspect while analysing the financial performance of MRF Ltd. This is related to the duration of the period, which is reported by MRF Ltd in 2016. Up to Sept 2014, MRF Ltd used to report its financial performance from October to September every year. Therefore, when the Companies Act 2013 mandated that all the companies should align their financial year to April to March, MRF Ltd had to change its reporting month from September earlier to March presently. As a result, the financial performance reported by MRF Ltd in 2016 is the business performance during the 18 months from October 2014 to March 2016. This presents a peculiar issue while comparing the business performance of the MRF Ltd year on year from its past reported performance. This is because the previous sales/profit numbers are for 12 months whereas the 2016 numbers are for 18 months. 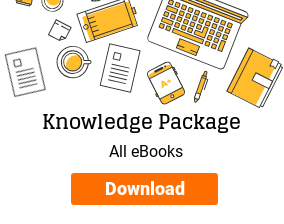 Turnover ratios like fixed asset turnover ratio, inventory turnover ratio etc. would seem higher as the assets/inventory figures at the year-end are to compare with sales of 12 months instead of 18 months, which is the case of MRF Ltd 2016. Receivables days would seem lower as in the case of MRF Ltd 2016, the account receivables at the year-end are being compared with 18 months of sales instead of 12 months of sales in normal practice. Higher fixed asset turnover ratio as explained above would give a picture of better asset utilization by the company than the reality. Higher turnover ratio and lower receivables days, as explained above, would give a picture of better working capital utilization by the company than the reality. Therefore, it is essential that while analysing the performance of MRF Ltd and comparing it with previous years, an investor adjusts the reported numbers of 2016 to reflect 12 months performance instead of 18 months presented by the company. 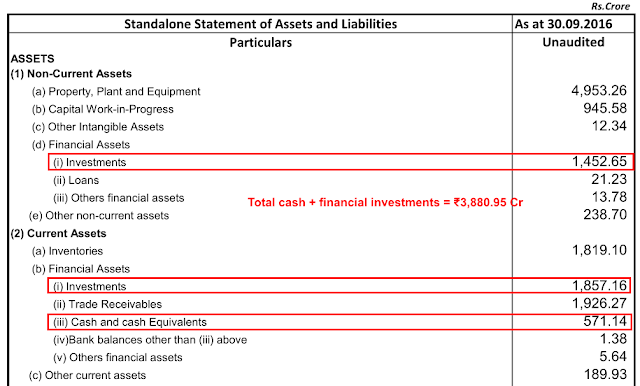 While analysing the standalone financial performance, this exercise is relatively simple as the investors have the standalone financial results of last 4 quarters available in the public domain and the revenue/profits etc. for the 12 months period can easily be deduced from them. However, as the company does not disclose its consolidated financial results in its quarterly updates, therefore, it becomes essential for investors to use some approximations to arrive at the comparable consolidated performance for 12 months period. We have used the simple approximation of reducing the 18 months of reported consolidated performance to 12 months by multiplying it with (2/3). The resultant consolidated sales figure is ₹13,695 cr, which is slightly higher than the reported standalone sales of ₹13,400 cr. by MRF Ltd during April 2015 – March 2016 as taken from the quarterly results. This is in-line with the fact that MRF Ltd has about 99% of the business within its parent standalone entity. 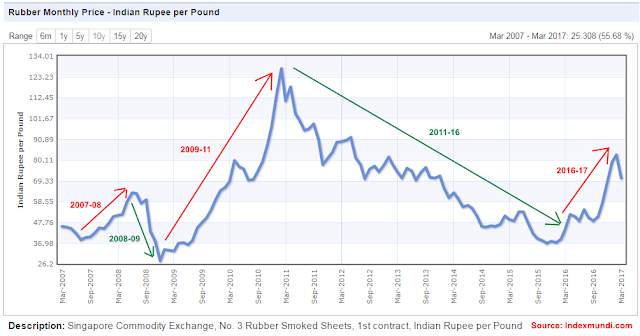 With this background, we would start to analyse the past financial performance of MRF Ltd over last 10 years. MRF Ltd has been growing its sales since last 10 years (FY2006-16) at a moderate pace of about 15% year on year. This growth rate has been associated with a consistent increase in the production capacity of the company over the years. As per the credit rating agency ICRA’s credit rationales for MRF Ltd, the production capacity has increased from 31.7 million tyres per year in 2011 to 53.4 million tyres in 2016. Such growth in sales along with consistent growth in volumes is essential for sustained business performance. This is because any growth, which is resultant of only price increase without an increase in sales volumes is bound to witness competition from substitute products. Moreover, as per ICRA 2016 credit rating rationale, the production capacities are currently nearly fully utilized. Full utilization of existing capacities necessitates that the company would have to do additional capex for generating incremental production capacity to support future growth. An analysis of the 2016 annual report, page 85, reflects that MRF Ltd has additional land in Gujarat, which it has provided as a security/mortgage for the debentures raised by it. This can be one of the many land parcels that the company might have in its possession. However, it reflects that the company might have spare land with it, which can be used for future expansion. An investor may get clarification from the company about whether this land parcel is industrial/commercial or residential in nature so that further clarity on its usage can be ascertained. At March 31, 2016, the company had in its possession cash & investment of about ₹2,904 cr at the consolidated level. At September 30, 2016, MRF Ltd in its standalone half year results declared a cash & investments position of ₹3,880 cr. The presence of spare land along with cash at hand presents a strong combination for the company that it has resources ready at its hand to go for further capex and support its growth in future. An investor would appreciate that the availability of resources needs a competent management, which is able to execute and complete projects. MRF Ltd has a history of executing projects. It currently has 9 plants out of which it has completed 3 plants in 2011 [7th Plant at Ankanpally (A.P), 8th plant in Trichy (TN)] and 2012 [9th plant in Trichy (TN)], (as per the company website>Who We Are>Milestones). A combination of land, cash and experienced management bodes well for the company that it can execute future capacity additions with success. The growth rate achieved by MRF Ltd in the past has been associated with fluctuating profitability margins. The operating profitability margin (OPM) of the company has been varying 8% to 10% in a cyclical manner from 2007 to 2012 and has been increasing since then. Currently, the OPM has increased from 11% in 2012 to 21% in 2016. Such improvement in the operating margins is a commendable performance for any company and it deserves further analysis. The key raw materials for MRF Ltd are rubber and crude derivatives (various chemicals). It would be very helpful for the investor to see the operating margins of MRF Ltd in association with the prices of natural rubber and crude oil prices. The above tables clearly reflect that the operating margins of MRF Ltd are vulnerable to the movement in the raw material prices. This is the pattern, which is reflective of any commodity business, which finds it difficult to pass on the fluctuations in the raw material prices to its end consumers. The above statements might give an impression to the reader that MRF Ltd has been working in a business environment where it can pass on the increase as well as a decrease in raw material cost to its customers and thereby maintain its profitability margins. However, as reflected by the above comparative analysis of the OPM of MRF Ltd with natural rubber and the crude oil prices, it clearly comes out that the OPM is highly susceptible to the changes in the raw material prices. The fluctuating OPM should indicate to the investor that the recent increase in the OPM to 21% (2016) might not be sustainable in future. This fact is established by observing the recent decline in the standalone OPM of MRF Ltd from 24% in June 2016 quarter to 18% in Dec 2016 quarter. This period has been associated with an increase in prices of both the key raw materials viz: natural rubber and crude oil derivatives. Fluctuating OPM is a characteristic of commodity businesses, which have products that are not much differentiated from their competitors. Tyres are such a product, where unless and until a customer has very specific requirements of usage, the tyres from any of the competitors might also serve the purpose with acceptable performance. 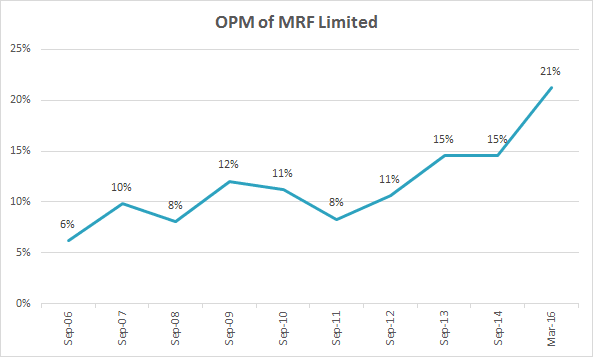 Similar to the fluctuating pattern of the operating profitability margin, the net profit margin (NPM) of MRF Ltd has also witnessed similar cyclical fluctuations over the years with NPM varying from 2% to 6% during 2006-2012 and then increasing to 12% in 2016. In the FY2017, the net standalone NPM has declined from 14% in June 2016 quarter to 9% in Dec 2016 quarter. Therefore, we believe that all the marketing expense that MRF Ltd is incurring (₹358 cr. standalone in 18 months ended March 2016), is leading to more awareness of the brand and higher volume sales but is not resulting in the pricing power in the hand of the company. Its margins are still susceptible to the fluctuating raw material prices due to competitive pressures. Significant capacity addition by existing domestic players, dedicated capacities for Indian market by MNC players and the cheap imports of tyres (90% from China) are some of the key factors, which will always put pressure on the profitability margins of MRF Ltd and the high OPM enjoyed by the company might not be sustained in future years. Therefore, it is advised that investor should keep a close watch on the movement of the operating profitability margins of MRF Ltd in future. Over the years, MRF Ltd has been paying its taxes at a rate, which is near the standard corporate tax rate applicable in India, which is a good sign. While assessing the sales/profit growth performance, an investor had to keep in mind that the reported performance by MRF Ltd in 2016 is for 18 month period and had to adjust it to 12 months period to compare it with previous years. In a similar manner, the investor needs to adjust the data to arrive at the operating efficiency parameters for MRF Ltd for 2016 as well. After adjustment, an investor would notice that the net fixed asset turnover ratio (NFAT) of MRF Ltd has been declining since 2010 from 6.58 to 3.40 in 2016. The decline in the initial years up to 2012 can be assigned to the newly added capacities of 7th, 8th and 9th plant commissioned in 2011 and 2012, which would take some time to generate sales at full capacity to lead to improved turnover. However, the consistent decline in the NFAT in the recent years from 4.16 in 2014 to 3.40 to 2016 (adjusted for 12 months) needs proper attention by the investor. It is to be noted by the investor that in recent years (from 2012 when the 9th plant was commissioned), the company does not seem to have constructed any new plant. Therefore, apparently, the capex since 2012 including ₹2,341 cr. in 2016 (18 months) and ₹240 cr. in H1-FY2017 seems to be going in the existing plants. Such large capital investment leading to lower NFAT indicate that with time the operations of the company are becoming more & more capital intensive, where the company has to consistently invest to develop new products, invest in plants to improve technology and at the same time cannot enjoy stable profitability margin due to more of a commodity product and cheaper imports. An investor needs to keep a close watch on the net fixed asset turnover of MRF Ltd. The company has enjoyed high profitability margins over last 5 years (2011-16) on account of declining natural rubber prices and crude oil prices. These profitability margins may not be sustainable in the long term. The impact of increasing rubber and crude oil prices in FY2017 is already visible in the declining profitability margins of the company in the current financial year. The high profitability margins in the recent years have helped the company to fund most of its capex through the cash generated from operations and thereby keep its debt levels in check and at the same time build up significant cash reserves. During 2012-2016, MRF Ltd generated cash from operations (CFO) of ₹7,276 cr. whereas it spent ₹4,489 cr in capital expenditure, which has helped the company to generated cash reserves of about ₹2,900 cr at March 31, 2016. As a result, in 2016, the company has witnessed improvement in its credit rating by ICRA from AA+ to AAA, which is the best credit rating possible for any corporate. However, it seems that the business of MRF Ltd will require significant investments going ahead in terms of new capacity additions to support growth, investment in existing plants to maintain/improve their production processes, R&D and branding. Whereas the times of high margins might not sustain for long, which would lead to the company using more cash than what it generates like in the past during 2006-2011. During 2007-2011, MRF Ltd did a capital expenditure of ₹3,379 cr. whereas it generated a CFO of ₹2,215 cr. during the same period. As a result, the company has to rely on debt to fund its capex needs. The debt of MRF Ltd increased from ₹729 cr. 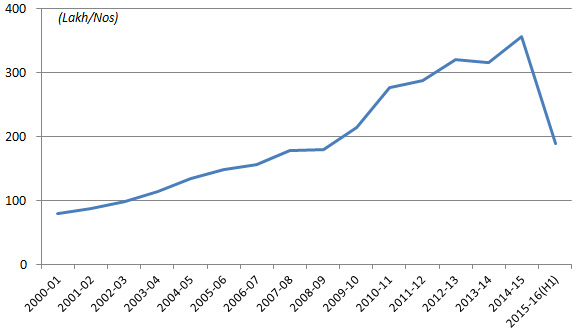 in 2006 to ₹1,600 cr in 2011. 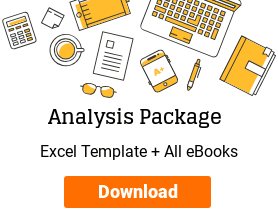 The major reason for discussing the period-wise CFO and capex data is to highlight to the investors that in cyclical industries, which have commodity type products, an investor should not become very optimistic based on recent good performance in terms of higher profitability and increasing cash reserves. As the cycle of raw material prices turns against the company, the consistent high capex requirements along with declining profitability margins would eat into the cash reserves of the company. That’s why it become essential for investors to analyse the past financial performance data of companies for preferably last 10 years to understand the business dynamics of the company. When an investor analyses the inventory turnover ratio (ITR) of MRF Ltd, then she would observe that the ITR has been stable at levels of 7-8 over the years. Stable ITR indicates an acceptable level of inventory management during the growth phase without letting inventory eat up into the funds. However, the receivables days of MRF Ltd have increased from 34 days in 2010 to 47 days in 2016 (adjusted for 12 months). Such deterioration in the receivables days indicates that MRF Ltd has to give attractive credit periods to its dealers/customers etc. in order to compete against other players and cheaper imports. Overall, the working capital management of MRF Ltd has been at a sustained level of about 90-95 days over the years indicating that the company has been able to keep its working capital under control despite witnessing significant growth over recent years. The same observation also gets established when an investor compares cumulative profit after tax (PAT) of MRF Ltd over 2006-2016 with the cumulative cash from operations (CFO) during the same period. Over FY2006-16, MRF Ltd reported a cumulative PAT of ₹6,282 cr. whereas over the same period, the company had the cumulative CFO of ₹9,765 cr. It indicates that MRF Ltd has been able to manage its working capital over the years. However, as mentioned above, the intense competition in the sector may also have an impact on the working capital position of the company in terms of obsolete inventory, the requirement to have higher stock/SKUs (stock keeping units) of a larger variety of tyres, higher credit period to customers/dealers etc. Therefore, it is advised that investors should keep a close watch on the working capital performance of MRF Ltd going ahead. The investor would notice that MRF Ltd has an SSGR of about 15-20% over the years, which is matching the sales growth rate of 15-17% being achieved by the company in the past. Over 2006-16, MRF Ltd has witnessed its sales increase from ₹3,724 cr. in 2006 to ₹13,695 cr. (2016, 12 months adjusted). To achieve this sales growth, though a look at the debt numbers would indicate that the company has to raise debt as the total debt figure has gone up from ₹729 cr. in 2006 to ₹2,463 cr in 2016, a net increase of ₹1,734 cr. However, when an investor looks at the cash & investments available with the company, then she notices that the cash and investments of MRF Ltd have increased by ₹2,785 cr. from ₹119 cr. in 2006 to ₹2,904 cr. in 2016. 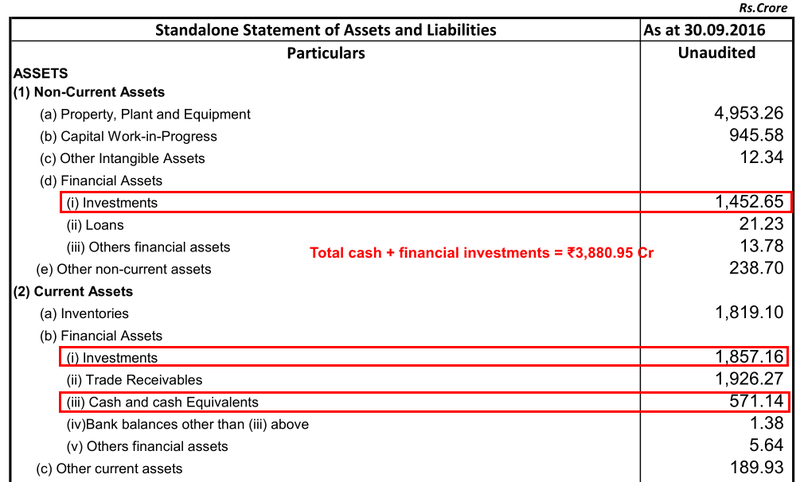 The above analysis indicates that MRF Ltd has been able to meet all its operational and capital expenditure requirements from its internal sources and that all the incremental debt raised by the company is effectively available as cash & investment balance with the company. This assessment of SSGR gets substantiated when the investor analyses the free cash flow (FCF) position of MRF Ltd.
An investor would notice that MRF Ltd has generated ₹9,765 cr. from cash flow from operations (CFO) over 2006-16 whereas it has spent ₹7,868 cr as capital expenditure over the same period resulting in a free cash flow (FCF) of ₹1,897 cr. Moreover, the company has utilized the free cash to pay dividends to shareholders of about ₹155 cr. The company could achieve an increase in market capitalization of about ₹23,821 cr. over 2006-16 versus the earnings retained and not distributed to shareholders of about ₹6,128 cr. 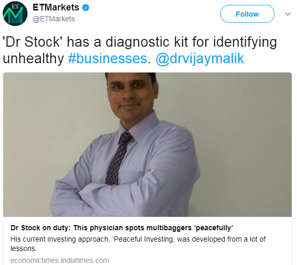 indicating that a market value of about ₹3.89 has been created by the company for its shareholders for each ₹1 of earnings retained by it over the years. While analysing the 2016 annual report, an investor would notice that the calculations of the figures provided by MRF Ltd in the section “Indebtedness” at page 35, do not tally. The debt data provided for the start of the period and the net change during the period do not sum up to the debt data provided for the end of the year. The annual report of the largest and reputed player of a key industry is not expected to have such errors. Therefore, it is advised that the investors may ask for clarity from the company about the data presented in this section of the annual report to rule out whether it is a genuine human error, which the company might want to rectify. If the number presented in the “Indebtedness” table are not erroneous, then further clarity may be sought from the company about their correct interpretation. 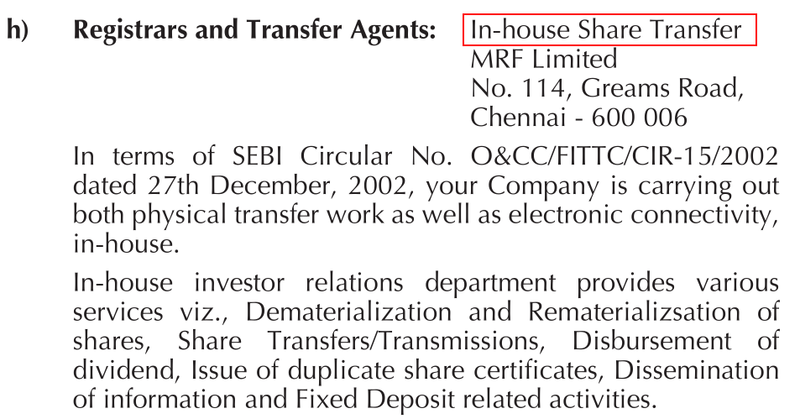 As per the 2016 annual report, MRF Ltd has an in-house department, which acts as the registrar & transfer agent (RTA) to perform various shareholders related activities like share transfer, dematerialization, re-materialization, dividend distribution etc. Therefore, we believe that as part of best practices, companies should have independent third party agencies as RTAs. 2016 annual report of MRF Ltd indicates that the company has purchased material worth about ₹240 cr. from companies/entities where the directors of the company are interested parties. Such transactions with promoters’ entities are key areas which carry the potential of helping smart promoters benefit themselves at the cost of public shareholders. An investor may analyse these transactions further to assess whether the same are at market prices and also to assess the need for MRF Ltd to deal with promoters’ entities rather than purchasing these products directly from independent vendors. Moreover, as the business of MRF Ltd is highly labour driven, it is essential that the company maintain good relationships with its workers. As per the 2016 annual report, the wage settlement with the workers’ union at one of their largest plants in Chennai at Thiruvottiyur is pending since long. The wage issue at Thiruvottiyur unit is a long drawn issue as there are news articles dating back to early 2000’s covering the wage issues at this unit. An investor should keep a close watch on the developments on the labour aspects of the company as any adverse development on this front can impact the company’s operations and future growth. The promoters’ shareholding in the company is low at 27.52% at Dec 31, 2016. However, if we notice that the promoter’s shareholding has been increasing slowly over the years from 25.31% at June 30, 2001. In the Dec 2016 quarter as well, the promoters’ shareholding has increased from 27.49% to 27.52%, which is positive factor. However, an investor would notice that despite low promoters’ shareholding, the promoters are well in the control of the company and are running the company’s business without any apparent dispute with other large shareholders. MRF Ltd is currently available at a P/E ratio of about 17, which does not offer a margin of safety in the purchase price as described by Benjamin Graham in his book The Intelligent Investor. However, as seen by the analysis of self-sustainable growth rate (SSGR) and the free cash flow (FCF), MRF Ltd has shown that it has a margin of safety in the business model. Overall, MRF Ltd seems to be a company which has been able to grow well during the past decade and has been able to capitalize on the declining trend in its key raw materials. As a result, the company has been able to improve its profitability margins and generate significant cash surplus in the last few years. However, with the raw material prices on an uptrend since about last one year, it remains to be seen whether MRF Ltd is able to sustain its profitability margins. The company operates in an industry, which is capital intensive and highly competitive necessitating continuous capital expenditure by the company without the ability to maintain its profitability margins. 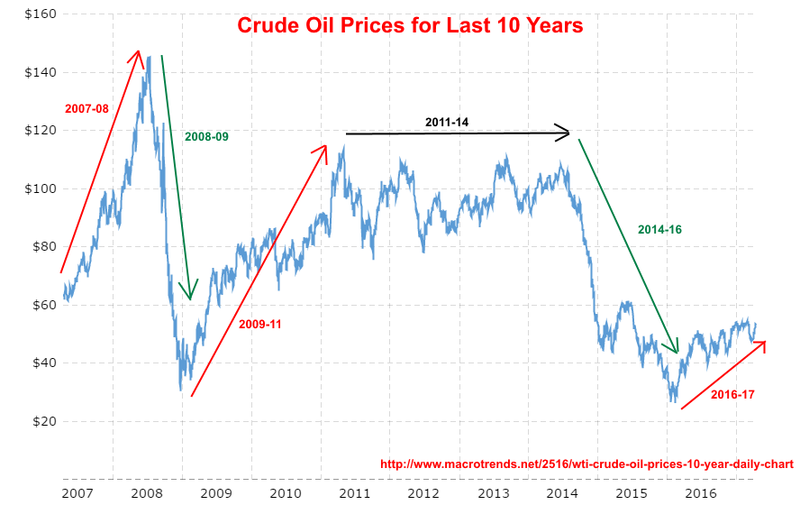 In the past, the company has benefited from the industry tailwinds of lower commodity prices. However, it remains to be seen whether the company is able to retain its balance sheet strength in light of significant capex being done by competitors and cheap import of tyres esp. from China. The management of the company is experienced in the field and has created a well-known brand in a seemingly commoditized product. The management has grown the company over the years and has brought it to the leading position in the industry by successfully executing the expansion projects in the past. With the apparent availability of land as well as cash at hand, it should not be difficult for the management to execute such project in future as well. However, the key monitoring factor for any investor in MRF Ltd would be to assess the performance of the company when the past tailwinds of favourable raw material prices turn against the company as the commodity cycle turns. Such times would require MRF Ltd to continuously do capex when the profitability margins would be falling. The ability of the management to maintain the balance sheet strength during such times would be the differentiating factor from other players if it is able to do so. These are our views about MRF Ltd. 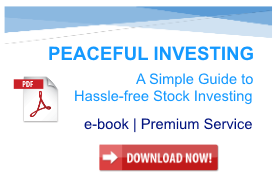 However, you should do your own analysis before taking any investment related decision about MRF Ltd.